For years the archive has sat in cardboard boxes in a cupboard and piled on shelves, and trying to look through it and find things has been a real needle in a haystack task, though exciting, because you never knew what you were going to find. From the start in 1891 there is an enormous amount of information, all well documented, from the many press cuttings about the very popular AGMs in West End theatres which were filled to capacity, programs of fundraising events, minutes of committee meetings, huge hard back volumes of accounts and probably the most exciting article, a hardback note book listing early committee meetings, the first page being the names in ink, of those attending the very first meeting 127 years ago! 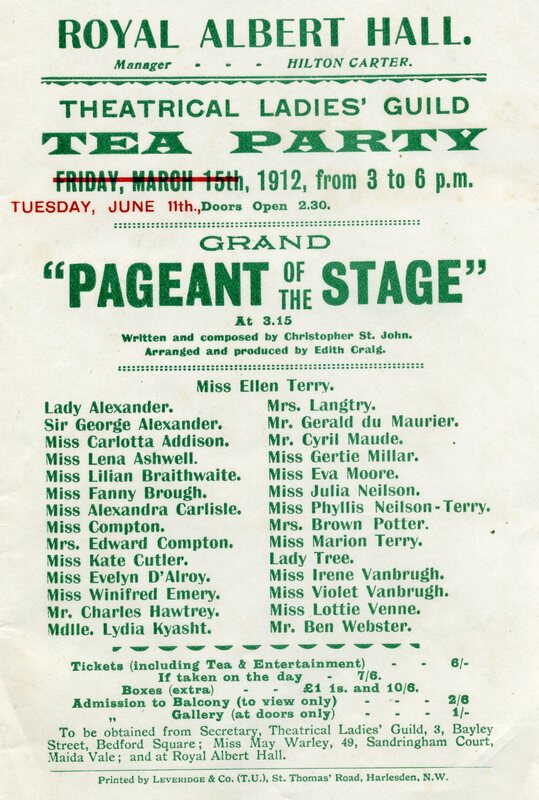 The archive is very thin during the 2nd World War and in the 1960s when The Theatrical Ladies Guild, as it had been called from the beginning, asked TACT – The Actors Charitable Trust – to take over the day to day running of the charity for a few years. Neither we or TACT have been able solve this mystery. And of course in latter years, since the arrival of computers, there are far fewer paper archives. It took the wonderful archivist Helen Raymond 2 days a week for 6 months to catalogue everything and store them in the correct anti acid boxes. The archive still goes on and the past can be added to. Please, if any of you out there have any papers, articles, etc to do with TTG and can let go of them, we would be so grateful and pleased to add them to our wonderfully newly organised archive.